AP reports that Arther C. Clark has died at age 90 in Sri Lanka, where he moved in 1956, of post-polio syndrome. 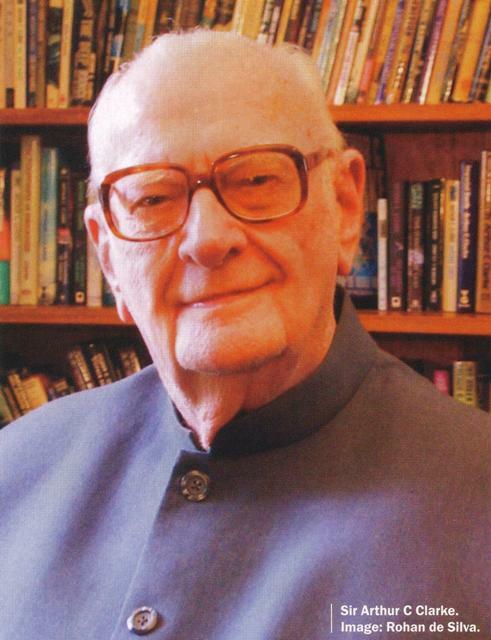 Clarke is best known for his science fiction books including 2001: A Space Odyssey and Rendezvous with Rama. Clarke has been credited with the idea of communications satellites in 1945, well before they became a reality. In recognition of his contributions to the development of satellites the International Astronomical Union has recognized a geostationary orbit as a “Clarke orbit”. Clarke also worked with Walter Cronkite as a commentator on the Apollo moon shots for CBS News in the late 1960’s. The Clinton campaign has many faults, but they certainly do not lack in chutzpah. They recently made a lot of noise about having Obama be Clinton’s running mate without ever explaining why the front runner should give up and take the VP spot. They have falsely claimed Clinton is the more experienced candidate so many times that many in the media actually act as if this is true, considering proximity to power as being real experience. Although they have based much of their campaign upon dishonest attacks, and Obama has run a remarkably clean campaign in response, they sent out an email yesterday falsely claiming that Obama has been doing the attacking. Here’s another example of the nonsense typically put out by the Clinton campaign last week. I’ve received a lot of ridiculous emails from the campaign which I haven’t posted as they were not sent for publication. There is no reason not to post this as I’ve been off their email list for a couple of months (for obvious reasons) and I did not receive this from the campaign with any agreement that it would not be posted. What makes this Clinton campaign email particularly interesting is that Obama’s people added their own comments (in bold). The path to 1600 Pennsylvania Avenue goes through Pennsylvania so if Barack Obama can’t win there, how will he win the general election? After setbacks in Ohio and Texas, Barack Obama needs to demonstrate that he can win the state of Pennsylvania. Pennsylvania is the last state with more than 15 electoral votes on the primary calendar and Barack Obama has lost six of the seven other largest states so far — every state except his home state of Illinois. In the last two weeks, Barack Obama has lost ground among men, women, Democrats, independents and Republicans — all of which point to a candidacy past its prime. But now Obama’s support has dropped among all these groups. In Mississippi, he won only 25% of Republicans and barely half of independents. In Ohio, he won only 48% of men, 41% of women and 42% of Democrats. In Texas, he won only 49% of independents and 46% of Democrats. And in Rhode Island, Obama won just 33% of women and 37% of Democrats. Why are so many voters turning away from Barack Obama in state after state? In the last few weeks, questions have arisen about Obama’s readiness to be president. In Virginia, 56% of Democratic primary voters said Obama was most qualified to be commander-in-chief. That number fell to 37% in Ohio, 35% in Rhode Island and 39% in Texas. So the late deciders — those making up their minds in the last days before the election — have been shifting to Hillary Clinton. Among those who made their decision in the last three days, Obama won 55% in Virginia and 53% in Wisconsin, but only 43% in Mississippi, 40% in Ohio, 39% in Texas and 37% in Rhode Island. If Barack Obama cannot reverse his downward spiral with a big win in Pennsylvania, he cannot possibly be competitive against John McCain in November. One other note on Pennsylvania. Despite the fact that Clinton will probably win the primary by a large margin, Obama is doing better than Clinton against McCain in the state. There is no correlation between the outcome of a party primary and the general election. Until Texas and Ohio voted on March 4, Obama was receiving far more support than Clinton from GOP voters, many of whom have said in interviews that they were willing to buck their party because they like the Illinois senator. In eight Democratic contests in January and February where detailed exit polling data were available on Republicans, Obama received, on average, about 57 percent of voters who identified themselves as Republicans. Clinton received, on average, a quarter of the Republican votes cast in those races. But as February gave way to March, the dynamics shifted in both parties’ contests: McCain ran away with the Republican race, and Obama, after posting 10 straight victories following Super Tuesday, was poised to run away with the Democratic race. That is when Republicans swung into action. Limbaugh’s exhortations seemed to work. In Ohio and Texas on March 4, Republicans comprised 9 percent of the Democratic primary electorate, more than twice the average GOP share of the turnout in the earlier contests where exit polling was conducted. Clinton ran about even with Obama among Republicans in both states, a far more favorable showing among GOP voters than in the early races. Some political blogs have suggested that the influx of Clinton-voting Republicans prevented Obama from winning delegates he otherwise would have, by inflating Clinton’s totals both statewide and in certain congressional districts. A writer for the liberal blog Daily Kos estimated that Obama could have netted an additional five delegates from Mississippi. It is also possible, though perhaps unlikely, that enough strategically minded Republicans voted for Clinton in Texas to give her a crucial primary victory there: Clinton received roughly 119,000 GOP votes in Texas, according to exit polls, and she beat Obama by about 101,000 votes.